While reading through my old programming notebook last month, I wondered about using them on my website. From my earliest programming days, the notebook has a number of programs that never made it to my stack of printouts. Canyon Raider, August�s program of the month, is one of those programs. 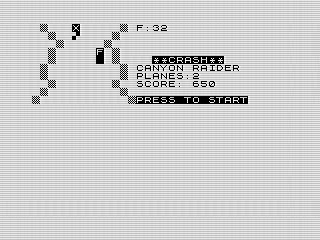 A simple scrolling game, Canyon Raider requires you to maneuver your plane around obstacles using the �Z� and �X� keys. To make things a bit more difficult, you have a fuel gauge to watch as well. Fortunately, you can refuel by running over F�s. But, if this is all you do you might be a bit disappointed with your score. 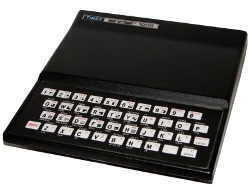 The only way you can gain any points is to press the �M� key and enter raider mode. While in raider mode, you can run into objects, including fuel, to rack up points. But don�t get comfortable. The mode is temporary and, while active, burns fives times a much fuel. Oh, and although hitting fuel gives you points, it won�t gain you fuel. You have to wait to return to normal before you can fill your tank. Dodging objects while watching your fuel consumption can, unfortunately, lead to a crashed plane. Good thing you have two more in reserve before the game ends. Three may seem like a lot, but you�ll be surprised how quickly your planes make their way to the scrape heap. And don�t forget, those canyon walls are always deadly. I have to admit, the program as written didn�t work quite right. Although testing and debugging a program is second nature now, back then I was excited just to come up with an idea. 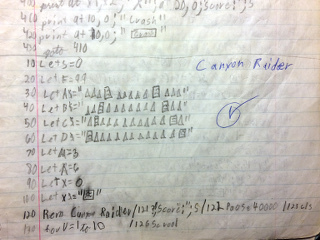 Canyon Raider, although overall a solid concept, had a few coding flaws that made it unplayable. Fortunately, I do test now. I fixed the flaws while leaving the game mechanics alone. Speaking of mechanics, Canyon Raider is a solid game. It has some decent complexity that makes it fun, while offering some randomness that keeps it fresh. I found the game gets tense when you enter raider mode and the random fuel dumps don�t show. The fact that you can�t rack up points without using raider mode forces you to make decisions and ultimately is what makes the game work.